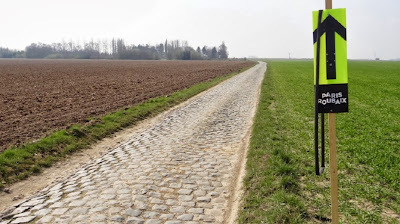 For those of us who have a soft spot for the hard cobbles of the spring classics, when sections of cobbles are included in the Tour de France in July, we get really excited. The cobbles represent the toughest of the tough in cycling and the thought of the 4% body fat climbers rattling atop of these massive rocks, brings a sense of amusement. The real risk of the cobbles is loosing time in week one. 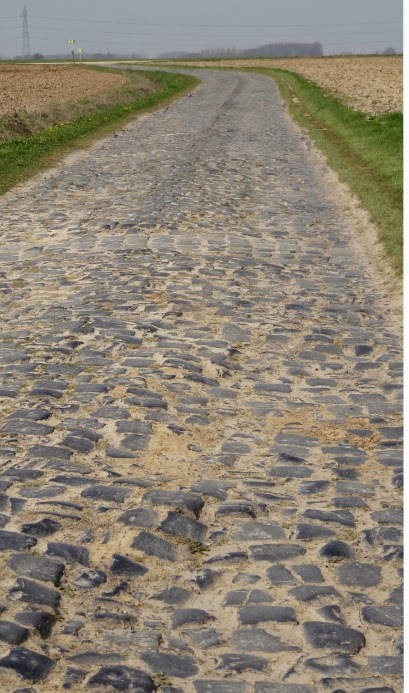 There will be ten-miles of cobbles in Stage 5 tomorrow. Equipment will be changed up a bit and team cars, domestiques and road side support staff will have to be on top of support through the narrow passages. Cobbles are on and off nerves, and jarring to the body, as riders struggle to get to the front of the group entering each cobbled section. Flats and falls can be costly. As much as a team dares to plan strategy for the day - you never know what will happen on a cobbled stage. The longest section of cobbles is within 20 km of the finish. The last cobbled section is 7km from the finish. They are not just thrown in for fun, the cobbles could make or break this stage, and race. The last time big cobbled secteurs were included in the Tour de France was in 2010, Thor Hushovd won the stage. Nobody knows what the outcome will be tomorrow. The mini Paris-Roubaix: Nine of the twenty-seven pave sectors will be ridden in the Tour de France this year. 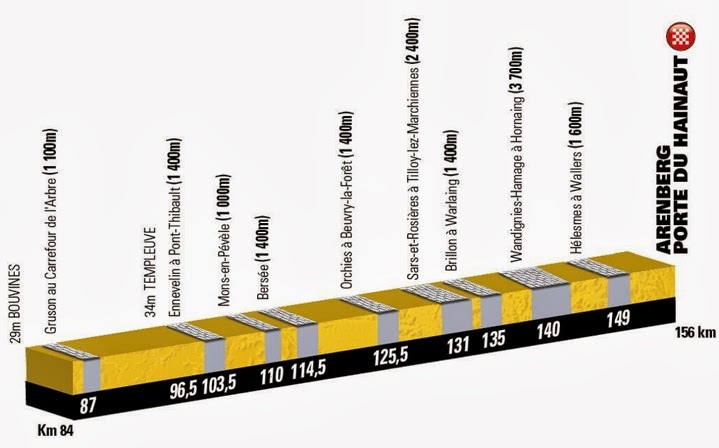 Here are the 9 sections [now 7 sections] of cobbles to be included on Stage 5 of the 2014 Tour de France and at which kilometer they appear on the stage. Sectors are pave are numbered from the 9 (first encountered) to the 1 (last encountered). 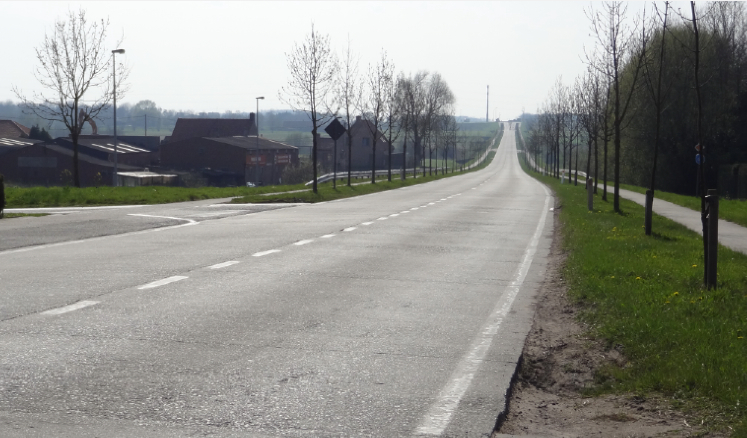 Update 9 July 2014: Two cobbled sections have been removed from the parcours due to bad weather and road conditions, they are sector 7 and sector 5. As a result, the length of the stage has been lessened by 3km. Riders will ride the Carrefour de 'Arbre in the reverse direction of the Paris-Roubaix route. 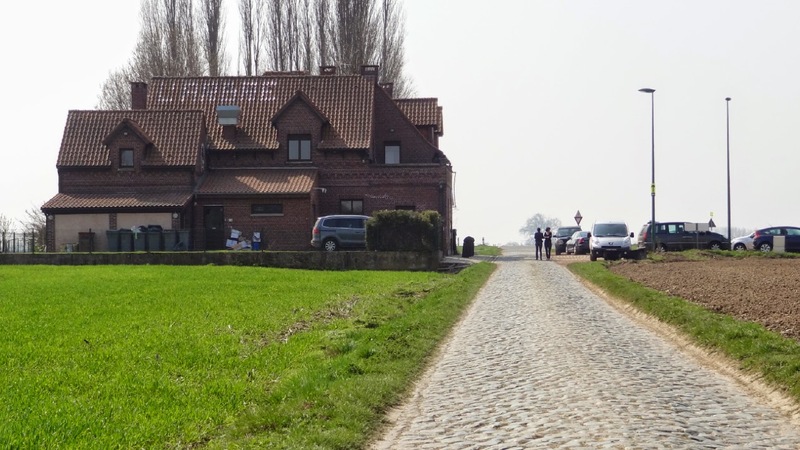 Related post by Pedal Dancer®: I went to Belgium and took pictures of cobbles photos from my trip to Le Carrefour de l'Arbre (ou Pavé de Luchin). Why so many names for the same cities? 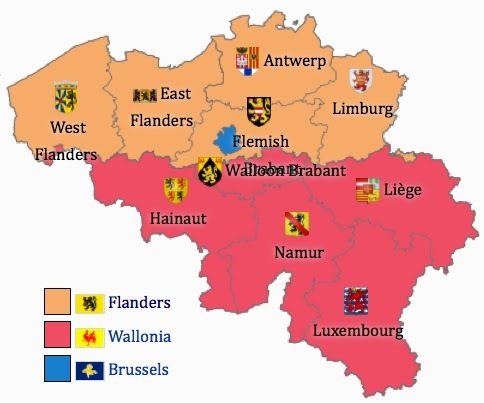 Belgium has three official languages: Dutch (1st: ~56%, 2nd: 15%), French (1st: ~38%, 2nd: ~48%), and German (1st: ~1%, 2nd: 27%). This also explains why so many pro riders from Belgium, Luxembourg and Netherlands likely speak four to five languages each if you add in English, Italian, or Spanish. World War I was fought between 1914-1918, one hundred years ago. 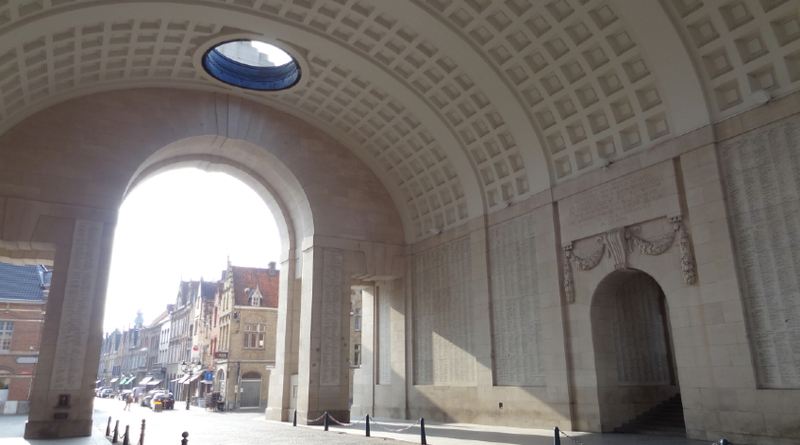 Stage 5 begins in Ypres, the location of the Menin Gate and Menin Road and center of many battles of the war. 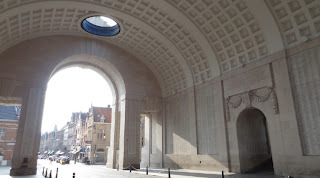 You cannot drive under this gate or down this road and not think of the thousands of men who walked out to their death in the fields of Flanders. The museum in Passendale (Passchedaele) and the In Flanders Field Museum are nearby, so too is the meticulously maintained field of Tyne Cot War Cemetary with 11,400 mostly British gravestones. One-hundred forty war cemeteries lie nearby. The long battle of Ypres Salient (The French term for "bulge") was the birth of modern warfare - machine guns ("the peacekeeper"), poison gas, and trenches ("dugouts"). If a battalion is equal to 1000 soldiers, and a division is equal to 10,000 soldiers, this one cemetery represents greater than one full division of men. Over 9 million lives were lost in WWI, 48 million in WWII. But over one million British soldiers were killed in WWI with 3 million casualties (76% of all forces). This is why to many commonwealth citizens, WWI was and will forever be "The Great War." Germany lost a devastating 3 million men in the war and refer to this battle as Kindermord, "Massacre of the Innocents." The term "all quiet on the western front," came from the battles in this area, so did "over the top" when the soldiers came out of the trenches to fight. This was also the site of the famous "Christmas Truce." My own Grandfather fought in five of the major wars in WWI. My Father's Father was a Command (Regimental) Sergeant Major in the 42nd rainbow division of the U.S. army and was later promoted by General Douglas MacArthur to First lieutenant (officer), the story is - because they played cards together. 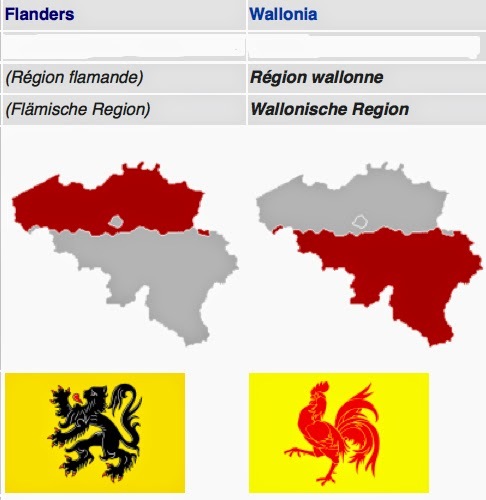 History lays on the land of Belgium. Some of the grand cities were partially spared or restored, but most of the buildings in the countryside are modern, that is because what had been there, was wiped out. The land has been reformed from years of bombing and trenches dug deep into the ground. You feel the war in this area of Belgium, even one-hundred years later. 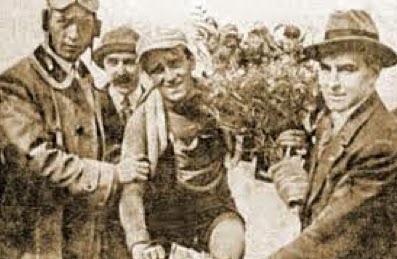 The winner of the 1914 Tour de France was Belgian Philippe Thys. He went on to fight in and survive the war. He returned to win his third Tour in 1920 (having also won in 1913). WWI claimed the lives of former Tour de France winners: Lucien Petit-Breton, François Faber and Octave Lapize. On the first day of the 1914 Tour de France, Franz Ferdinand, Archduke of Austria was assassinated in Sarajevo. Because of various alliances made between countries, world war was inevitable. A major war had not been fought for many years, but brutal means of fighting was invented quickly. Unfortunately the war to end all wars lead to, or is responsible for, most of our modern day wars since that one fateful day in 1914. The Tour de France would not return again until 1919. Related post by Pedal Dancer®: The Missing Years About the impact the world wars had on the Tour de France. I would highly recommend spending some time being a tourist in Belgium - for the history, art, architecture and beer. Nearby to Stage 5 are the popular tourist destinations of Brugge, Ghent and Brussels. Kortrijk is the city where many of the pro teams base themselves for the Tour of Flanders and Paris-Roubaix weeks. The famous Roubaix velodrome is also nearby across the border in northern France (visit and leave, and be safe, crime is high). As a tourist, I would definitely avoid the cities of Roubaix or Lille. 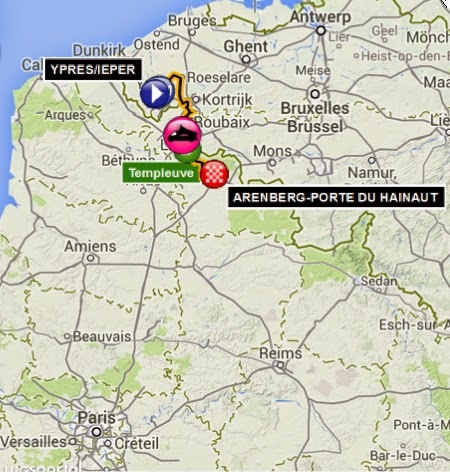 Paris is a three-hour drive south from Ypres. My photos of the Roubaix Velodrome here 2014 Paris-Roubaix. 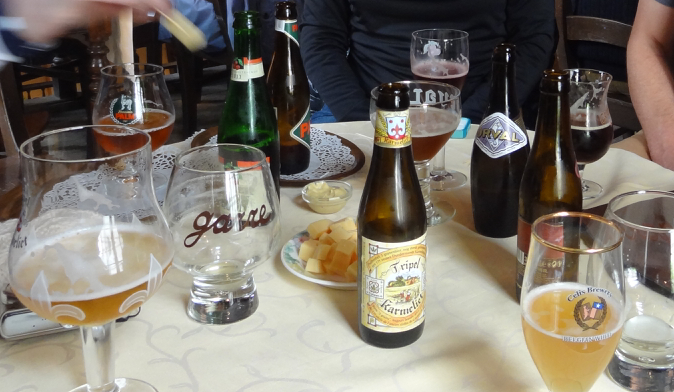 Belgium beer in Brugge: Beers in Belgium. 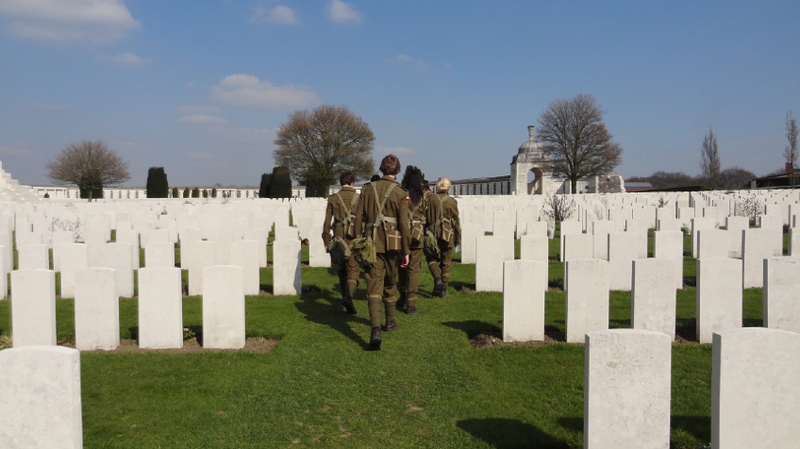 A day in Ypres and Tyne Cot War Cemetery, and more about WWI: Day 5 in Flanders. I am really looking forward to watching this stage tomorrow. 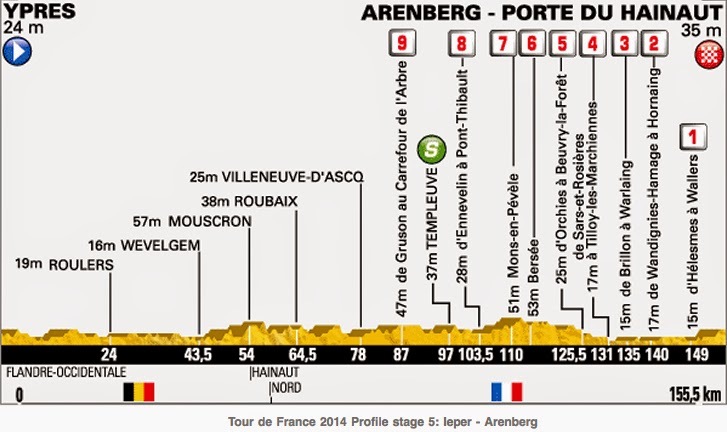 Stage 5 is one of the key stages of the 2014 TDF. The other key stages are 10, 14, 17, 20, with must see also stages 13, 16, 18. Tomorrow's theme will be: Pain is temporary, time once spent, is gone forever. Don't mess this one up!